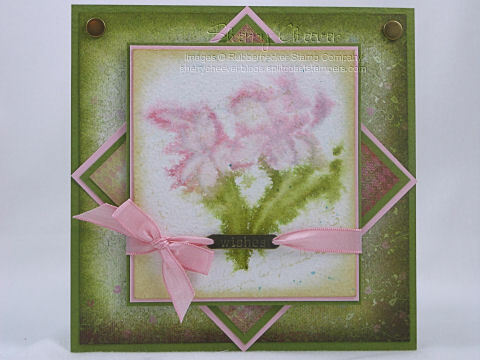 Some of you who have been stamping for several years or more, may have heard of KK Originals, a line of stamps drawn by Kathy Kaberline. KK Originals are fresh and unique images, that the artist has drawn with her on personal twist. 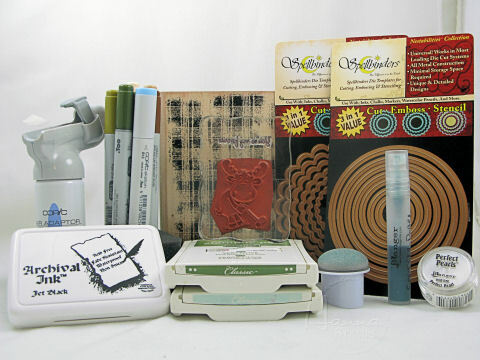 Rubbernecker Stamp Company is pleased to announce that they have obtained distribution rights to KK Originals. Starting Tuesday, April 1st, KK Originals will be available for purchase on the Rubbernecker site. However, today you will be able to see previews of some of the images available, by visiting the blogs of the Rubbernecker Design Team. We’ve all made samples using KK Originals for the Rubbernecker Blog Challenge today.The colors for the Rubbernecker Blog Challenge today are pink, lavender and green. The image was stamped on Neenah Classic Crest Solar White and then colored with Copic Markers. The area around the image was air brushed with my Copic Airbrush System. To make the mask, I stamped the image, but it out and then covered the back with rubber cement. If you place the mask on while the rubber cement is still damp, it is temporary and will not move while using the airbrush. However, once you are ready to take the mask off, it removes easily and then the excess rubber cement wipes off. The sentiment was stamped in Archival Jet Black and mounted on varying layers of cardstock cut with Nestabilities. The designer paper was sewn to the background panels, and the piercing around the image was done on the sewing machine, thread removed and the stitch width was set at 4. Both the image and the sentiment are raised on mounting tape. When I bought this ribbon a few years ago, I absolutely loved it, but have never had the opportunity to use it. It so fits with the colors of this challenge, and I’m glad I had it in my stash. Oh my BADness! It’s Friday already! I hope everyone has had a good week and you’re all set to enjoy your weekend. You guys absolutely ROCK! I had more responses and emails yesterday that were so helpful. I’ve come to believe that so many of you that responded that I might have a trigger finger – I think you are correct. I did some research and it appears to be just that! I will be seeing my physician. I also have to give a big shout out for those of you who inquired about my wheat free diet. I have so enjoyed the emails back and forth and all the information that we have exchanged. I feel like I have made new friends! THANKS TO EVERYONE!! 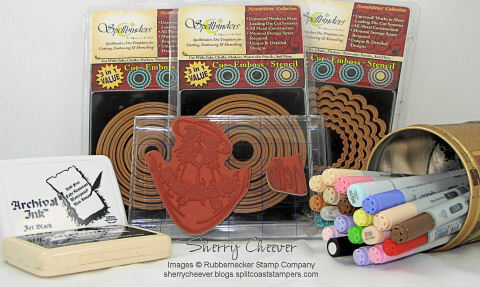 I mentioned earlier in the week that you want to check back here on April 1st that Rubbernecker Stamp Company would be releasing a line of stamps. I can’t reveal anything about them yet, but I can tell you that the Design Team has been having so much fun working on samples and previews for you. Actually, I wouldn’t be surprised if you don’t see some sneak peeks appearing on some blogs Monday. Fun, fun, fun! Believe it or not, I actually pulled myself out of bed earlier today, and decided to spend the morning in the hot tub with my morning coffee. Actually, it was to help with my finger and my back, but oh my gosh – I had forgotten how much I enjoy the mornings lolling in the tub. It seems with the pups running around I haven’t been taking advantage of just lolling around. However, they are spending a few days of Spring Break on the river with Kate and the draw was just too much this morning. I felt totally invigorated! So, with all this energy this morning I headed to the stamp room earlier than normal. I loved today’s Limited Supply Challenge on Splitcoast. The object of the challenge today is to use an embellishment that you purchased because you just had to have it, and then wondered why did you ever buy that to begin with. Well, I have plenty of embellishments that fit this challenge. 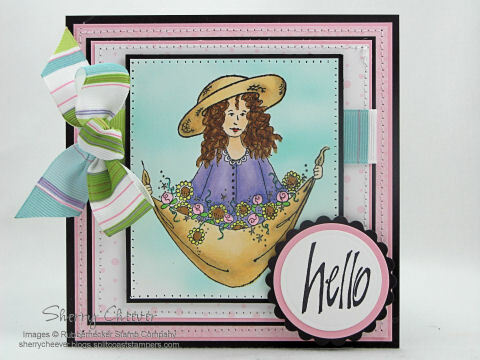 The second part of the challenge is to make a floral card. Well, I can do that too! I inked the brushed lily image with Worn Lipstick and Peeled Paint Distress Inks by tapping the corner of the pad around the image, misted with water and stamped on a piece of watercolor paper that I had already misted with water. While still wet, I added some Tattered Rose to lighten the shades of the lily and worked the darker into the open areas of the flower. I then misted the entire panel with Shimmer Mist made with Broken China and Gold Perfect Pearls. Once dry, I stamped very lightly (so lightly you can hardly see it) French Letter graphic over the image in Antique Linen. Once complete, I sponged the edges with Antique Linen. For my background paper, and I had forgotten I had this. I used Memory Box Enlighten. All the edges were sponged with Peeled Paint, because I had cut the paper down and it left two sides without the original shading. For my embellishment and sentiment, I picked a metal tag line that I just had to buy one day at Archivers. I have picked this tag line up over and over again, and keep throwing it back in the drawer. Today I made it work by taking the chains off either side and running the ribbon through it to fasten to the card. Those brads in the corners are another embellishment I just had to have and rarely use. I hope you enjoy your weekend and don’t get into too much trouble! Happy Thursday! Hope everyone is having a great day so far. Once again, I drug my flabby fanny out of bed a little after 9:00 a.m. (I have got to quit this) to rain. I looked out and the streets were flooded once again, but luckily the carpet in the stamp room is still dry. Cross your fingers for me! I’m curious today. How many of you have fingers that lock up? When I got up yesterday morning, the ring finger on my right hand was locked. It was folded down toward my palm and didn’t want to move back into place. I had to give it a little nudge with my left hand. It bothered me throughout day the yesterday and this morning it was the same thing again. I called my mother, because her thumb used to do this. I asked her what caused it. I am thinking my diet is not the most spectacular and I might be missing some needed vitamins. She told me I was just getting old! That her fingers have gotten worse and she really didn’t know what it was except maybe arthritis. Which makes sense, I have spent the better part of my life working as a legal secretary and typing is just second nature to me. As for my diet, some of you know this and most of you don’t, I have a wheat allergy. Since last November I have been on a gluten/wheat free diet. Sometimes I slip and I’ve been slipping quite often the last few weeks. 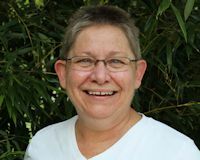 But for the most part, I can stick to the diet but I seem to go for the easy things – rice cakes with chicken salad, ham rolled up in cheese, and oatmeal with bananas. Let’s not forget that I will never give up my chocolate, but I have learned that it must be plain milk chocolate – nothing else added but maybe almonds (which I eat by the handfuls – almonds that is). Anyway, enough of my babbling about diet, etc., I’m more curious if this is happening to anyone else and what you do for it. So, spill! I’m curious! I was excited when I saw that the SCS Ways to Use it Challenge is a spray challenge. The challenge is to have fun spraying – glimmer mist, airbrush, color spritzer, water misting – anything that you can spray. I’ve had some Rileys from Hanna Stamps sitting out on my desk for a few weeks now, and one of them is Golfer Riley. It’s warming up, it’s almost golf season here in this area and today seemed like a perfect day to use Riley. Riley and the green were colored with Copic Markers and then I airbrushed the sky with the Copic Airbrush System. I learned the other day how to make the perfect mask for working with the airbrush system. I stamp the image on either a post-it or a sheet from a writing tablet, cut it out and then paint the back with rubber cement. While the rubber cement is still wet, place it on your image. You can airbrush the masked image then and the mask doesn’t come up. You need to remove the mask carefully, by pulling from one corner, but when you have removed the mask, the rubber cement will clean right off your image. Just take you fingers and wipe across and the rubber cement rolls right off (not to be gross or anything, but it’s kinda like a booger). Anyhoo, back to the card. The blue panel behind Riley, is Soft Sky paper, that I misted with Shimmer Mist that I made with Soft Sky Reinker, Perfect Pearls and water. Once the layer had dried, I sponged both the edges of this panel and the image panel with Soft Sky. 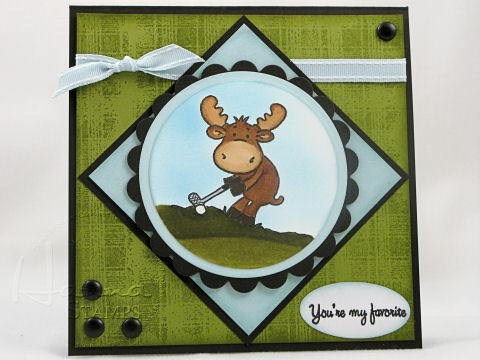 I decided on the sentiment “You’re my favorite” from the set Things Hanna Would Say, well because I could then right on the inside “DUFFER!” BWAHAHAHAHAHAHA – can’t wait to send this one to a golfing buddy! Happy Hump Day! I hope everyone is having a great day so far. I slept in this morning – not on purpose, but wow – it sure felt good! Of course, that now puts me behind in my day, but who cares! I sure don’t!